In Primrose yellow with a black interior. Sold by us six years ago, this smart C roadster is a rare automatic gearbox version which suits the lazy engine characteristics very well. The car has been cherished by a PMC regular who has chosen to go to something crazy with three wheels and no roof! 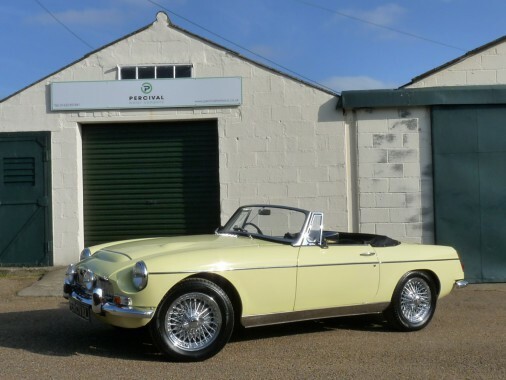 MGCs have 3.0 litre, six cylinder engine and twin carburettors. This car has the three speed automatic gearbox and is fitted with 123 electronic ignition, a stainless steel exhaust, spot lights, tonneau cover, chrome wire wheels and it has a nicely detailed engine bay. Inside it comes with a walnut dashboard, recent carpets, black leather seats and some additional gauges neatly mounted under the dash. The C was part of the Sir Anthony Joliffe collection (Ex-Mayor of London) during the nineteen eighties. The car remains in lovely order.